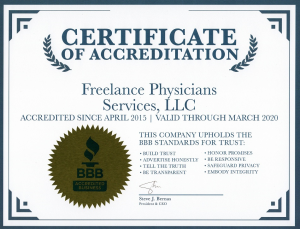 Freelance Physicians Services LLC takes the privacy of its clients very seriously. In compliance with HIPAA regulations, we are required to provide you with this notice to make you aware of what information Freelance Physicians Services LLC gathers from you, choices you have about the way your information is used and to explain how we protect your information. Digital information we exchange with our clients is protected by a minimum of 128-bit encryption using Secure Socket Layer (SSL) technology. • We must follow the duties and privacy practices described in this notice and give you a copy of it upon request. For certain health information, you can tell us your choices about what we share. Tell us what you want us to do, and we will follow your instructions regarding sharing information with your family, close friends, or others involved in your care. We never share your information for marketing purposes or sale of your information. • We request and store some of your personal and health information, including, but not limited to: name, address, email, insurance information, medical provider information, hospital records and medical bill data. This information needs to be collected, maintained and made available to Freelance Physicians Services LLC healthcare professionals within the scope of what is necessary to achieve successful negotiation of your medical bills. • Email, fax and electronic file communication and/or files that you send to us via the links on our Website. If you provide personal and health information in your email, it will be used only for the purposes of responding to your email. From time to time, we may send you service-related emails. • Freelance Physicians Services LLC may collect and store aggregate user statistics and other information about the online activities of clients, such as tracking the number of clients who use certain features of our service through third party tracking and marketing services. No information collected in this manner is linked to personal or health information. • The site also collects information such as name, email and phone numbers. • We limit access to your personal and health information to employees having a reasonable need to access this information who provide services to you. Employees who misuse information are subject to disciplinary action, including termination. • We have physical, technical and procedural safeguards to help protect your personal and health information and safely delete any information no longer needed. • We use secure socket layer (SSL) encryption to help protect this information while it is in transit between your computer and our servers. • We use Hack Alert Malware Monitoring as an added security measure to protect our website from hacking and intrusions. • In areas that contain your credit/debit card information, we use PayPal as third party payment processor. • While Freelance Physicians Services LLC takes all reasonable precautions, “perfect security” does not exist on the Internet. Freelance Physicians Services LLC cannot guarantee the security and confidentiality of e-mail communication and online file transfer, and will not be liable for improper disclosure of confidential information that is not caused by Freelance Physicians Services LLC’s intentional misconduct. By using the Site, you acknowledge that you understand and agree to assume these risks. We will retain your information for as long as your account is active or as needed to provide you with our services. We will retain and use your information as necessary to comply with our legal obligations, resolve disputes, and enforce our agreement. • Complying with the law: We will share information about you if state or federal laws require it, including with the Department of Health and Human Services if it wants to see that we’re complying with federal privacy law. • Responding to lawsuits and legal actions: We can share health information about you in response to a court or administrative order, or in response to a subpoena. In the course of Freelance Physicians Services LLC’s business development and for other lawful purposes, the company may disclose aggregated or summary level (non-personal) data about our customer group as a whole in order to describe the size and demographics of our services. In the event personal information must be disclosed to judicial or other government agencies subject to laws, statutes, warrants, subpoenas, or other governmental orders, Freelance Physicians Services LLC shall disclose only such part of the personal Information as is specifically required by the terms of such legal order. 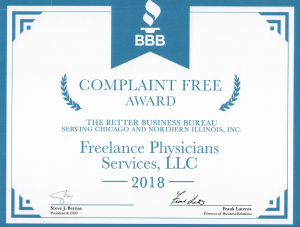 If Freelance Physicians Services LLC is involved in a merger, acquisition, or sale of all or a portion of its assets, you will be notified via email and/or prominent notice on our Website of any change in ownership or uses of your personal information, as well as any choices you may have regarding your personal information. • Choose your passwords carefully: Don’t use your name, address, phone number, initials, Social Security number, license plate or birthday. Don’t use names of your friends, family or pets, company names, common numerical sequences or the word “password.” Also, remember to change your password occasionally and never give your password to anyone. • When you finish your online session, close your browser to erase any information it may have temporarily stored on your computer. This policy became effective in August of 2014 and is updated periodically.